Normally, all products reviewed in SoundStage! are listened to an extensive time period within the reviewer's system. The following article about the Wisdom Audio Adrenaline Line Source loudspeaker reflects Mike Masztal's experience with this loudspeaker at a demonstration conducted by the manufacturer. Although not a 'conventional' review, we felt the information about this product would be of interest to SoundStage! readers. 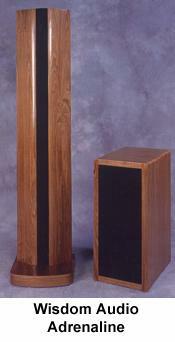 Audiophiles in Atlanta recently had the opportunity to listen to a new speaker system from a not-so-new designer. Tom Bohlender, past president and co-founder of driver manufacturer, Bohlender-Graebener, Inc., has ventured into the high end with a new line of speakers that extend the envelope of performance. Rather than spend an enormous sum of money on an advertising campaign, Tom wisely chose to visit several audio societies across the country and get feedback from those who know. The Adrenaline Line Source is a four piece unit consisting of two 76" towers containing the bipolar planar drivers and two subwoofer cabinets. Integral to the system is the Active Brain adjustable crossover. The subwoofers or "low frequency regenerators" also come in a choice of designs. The single has a 12" voice coil cone transducer and the double has two 12" transducers. The "Active Brain" is a fourth-order constant voltage electronic crossover offering both low and high pass outlets. This allows the listener to fine tune the amount of low end presence he or she would prefer. The cost of the dipole line source/dipole subwoofer/Active Brain is $25,650. Tom's plans for this speaker have been in the works for some time. He first began using planar speakers many years ago in a pizza restaurant he owned. Live music was the big attraction and Tom wanted the sound system to sound like the one in his home. Being a long term fan of planar and electrostatic designs, Tom used a planar driver designed by David Graebener for the PA system in the restaurant. He said the sound from these drivers far surpassed the standard PA fare of the day (Peavey, EV, etc.) and his patrons agreed. A common-sense tweaker from the get-go, Tom along with Dave Greabener performed some mods to the Graebener driver which vastly improved the sound and power handling characteristics. Tom later began speaking with Dave about driver design on a regular basis . A friendship developed resulting in the birth of Bohlender-Graebener speaker works. B-G is best known for manufacturing the drivers for RADIA home theater speaker company. Wisdom Audio also has two other versions of the Adrenaline in monopolar configuration starting at $18,600/system. The cabinets of the drivers are personally built and beautifully finished by well known luthier, Dave Kunkle. A variety of exotic finishes are available, but be prepared to pay for them. A caveat, along with the low frequency regenerators, the Adrenaline system is BIG. The size and design of the Adrenaline system requires that they have a good bit of breathing room. Being a bipolar design, they need at least 5' open space behind them, but, their wide dispersal characteristics lend me to believe that finding optimum room placement shouldn't be too difficult. The hotel suite we were in measured about 18' by 28' with 9' ceilings. A bigger room would have been nice. Amplifiers were solid state. They were Wisdom Audio prototypes designed by Steve Dunlap, of Memphis, with the Adrenaline in mind. The subwoofers were powered by a 200w/ch dual-mono amp while the towers each had 400w monoblocks delivering the juice. Tom explained that the amps idle at class AB and revert to class A when amplifying source material. The monoblocks are projected to be priced about $3000 ea., and the stereo amp at the same price. Digital source was a Meridian 508, 20 bit player going through an Audio Research LS 3. Interconnects and speaker cabling was Nordost Red Dawn. Power cables were by TIFF. So, how does $25,000. sound? I'll get to that. Many in the audiophile community use terms like "imaging," "seamless," and "soundstage," in addition to frequency range, etc., while describing a speaker's performance. I've heard a lot of fine speakers over the years and usually note how precise a soundstage a speaker reproduces. A good design presents a wide soundstage with good depth and stable imaging. On a real good design, you can determine where you would be seated in the auditorium by triangulating back from the edges of the soundstage and almost "see" the stage area in all it's full width and depth. So, how does $25,000. sound? About the only way I can answer that is to use a term I have never used before. ROOMSTAGE!!!! Yup. This is the first time I've heard a speaker reproduce not only the precise dimensions of the stage, but also those of the auditorium. Listening to my favorite CD, Ottmar Liebert's VIVA! (see my review in July's SoundStage! ), I could actually perceive the dimensions of the space around me. I could visualize where the walls and ceiling would be. At first, I had to look around to see if this wasn't in fact, a multi-speaker design. "Effortless" would be another appropriate description of the sound. There was absolutely no hint of stridency to the Adrenaline system. These speakers have the ability to play loud without sounding loud. Balance was flawless and frequency response was seamless. These virtues also extended to the Adrenaline's large sweet spot. Sitting up to 60 degrees off axis, I was still able to listen to the wide soundstage they project, although the roomstage effect was not as well defined. All in all, a remarkable effort by Tom Bohlender. I know...I know...I can hear it..."What the #%$! is this guy doing reviewing $25,000 speakers? My whole system doesn't cost that!! Who the heck can afford it!?!" Well, I used to say the same thing reading hi-end reviews several years ago, but guess what? That mega-expensive stuff from a few years back is affordable today!! I'm merely giving you a glimpse of what you can expect your system to sound like in the future! I think it would be great fun to do a formal review in my home, but I doubt I'd be willing to give them up. The Adrenaline system has tremendous potential. Considering we were in a hotel room with who knows what kind of garbage AC power for the electronics, we still got great sound. How much better these babies could sound experimenting with different cabling, amplification, room size, cleaner AC power, etc., is anyone's guess, but I got the impression I heard only a glimpse of the Adrenaline system's capabilities. If reproducing the reality is important to you, the Adrenaline System might just be your ticket.